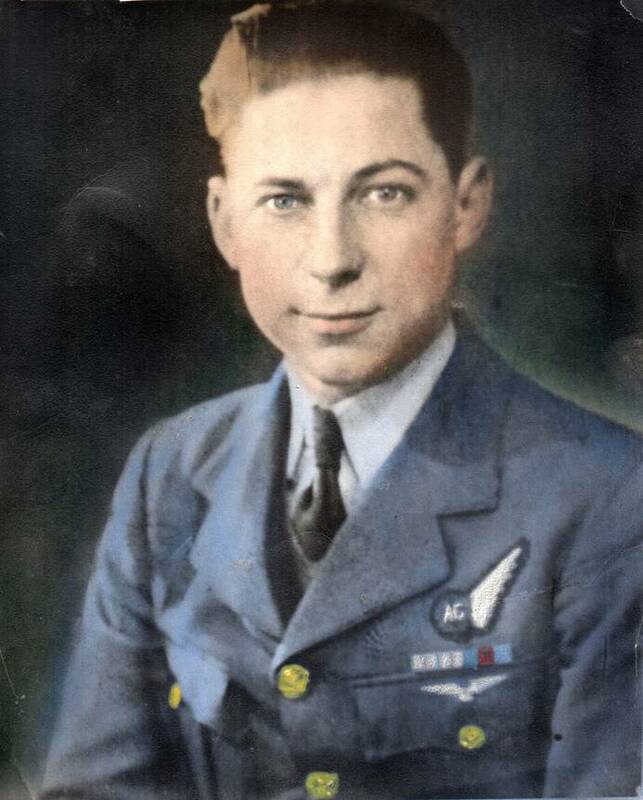 Percy was conscripted to the RAF at aged 18. He was a Mid Upper Gunner in the Lancaster Bomber and served with 100 Squadron for his 1st Tour (March to July 1943) and 97 Squadron for his second (March 1944 to August 1944). He completed 46 operations. "This NCO has completed 32 operational sorties, 11 of them with the PFF. As a gunner in one of the squadron's outstanding crews, he has flown against many heavily defended German targets. He has at all times displayed great keenness and offensive spirit in his work and by his keen and quick action has several times enabled his pilot successfully to evade fighter attacks. 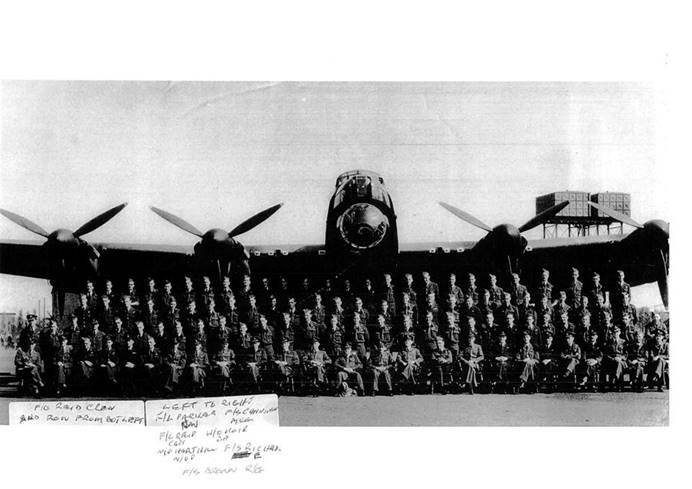 I strongly recommend that he be awarded the DFM"
Sadly no photos of his crew apart from this poor quality one of the whole Squadron taken in 1944. List of Operations flown by Percy with 97 Sq. 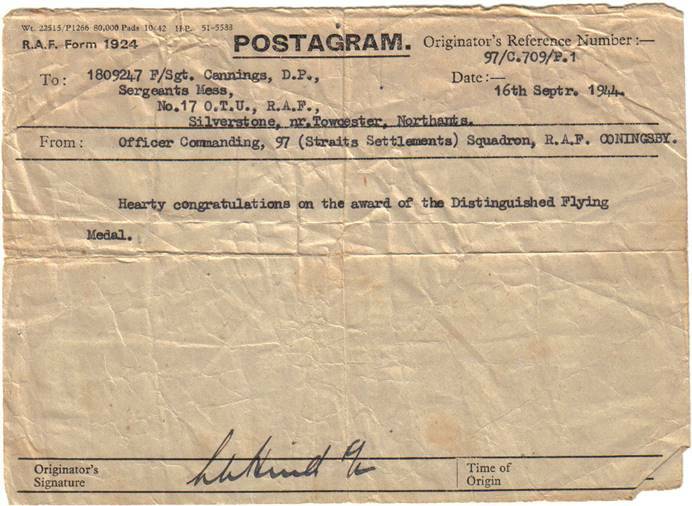 JB708R F/O W.Reid, Sgt W.Richards, F/O R.D.Parker, Sgt G.D.Moir, F/Sgt B.Harthill, F/Sgt S.Cannings, Sgt G.Brown. Up 1935 Down 0225. 5 x 2000lb. Stuttgart bombed from 19,300’. Vis fair. The first Wanganui went down at 2310 hours but this was not backed up for about 5 minutes. Later three separate concentrations appeared to form. ND346N F/O W.M.Reid, Sgt Richards, F/O R.D.Parker, Sgt G.D.Moir, F/Sgt B.Harthill, F/Sgt D.P.Cannings, Sgt G.Brown. Up 1855 Down 0125. 4 x TI, 1 x 4000lb, 850 x 4lb incs, 50 x 4lb incs. 7/10ths cloud over Berlin tops 8,000’. Vis good. Bombed from 19,000’. Glow seen from 4 green TIs burning on ground. Later two clusters of Wanganuis fell close together followed by many more making fair concentration. Suspected dummy red TIs seen ½ mile apart. ND807P F/O W.M.Reid, Sgt W.Richards, F/O R.D.Parker, F/Sgt G.D.Moir, F/Sgt B.Harthill, F/Sgt D.P.Cannings, Sgt G.Brown. Up 2318 Down 0315. 5 x 4 x 7” flares, 4 x 1000lb GP, 5 x 1000lb MC. Some haze over target area. Visibility good. La Chappelle topped at 01.07.5 hours. Bombed at 14,000’ on green TI and four red spot fires. Order to bomb received on W/T. RSF clearly seen in centre of marshalling yards. Bombing very concentrated – nothing heard over R/T over target. ND807P F/O W.M.Reid, Sgt W.Richards, F/O R.D.Parker, Sgt E.D.Moir, F/Sgt B.Harthill, F/Sgt D.P.Cannings, Sgt G.Brown. Up 2352 Down 0512. 12 x cluster flares, 1 x target flare, 1 x green TI. Target Brunswick thin layer cirrus cloud at approximately 19,000’ with thick haze below. Identified target by another aircraft. H2S failed approximately enemy coast. Dropped flare on another illuminator later seen to be two miles south of target. Several red spot fires seen but one stood out with green TI adjacent. Heard order to bomb by VHF. Initial bombing appeared accurate. ND807P F/O W.M.Reid, Sgt W.Richards, F/O R.D.Parker, Sgt G.D.Moir, F/Sgt B.Harthill, F/Sgt D.P.Cannings, Sgt G.Brown. Up 2058 Down 0645. 12 x cluster flares, 1 x green TI no 4. No cloud, good visibility over area. Attacked on H2S. Datum point well marked. Flares in target area. RSFs well concentrated, very accurate bombing, many fires later merged into one large mass of deep red flames. On homeward journey observed Karlsruhe burning very well. ND807P F/O W.M.Reid, Sgt W.Richards, F/O R.D.Parker, F/Sgt E.D.Moir, F/Sgt B.Harthill, F/Sgt D.P.Cannings, Sgt G.Brown. Up 2118 Down 0612. 1 x yellow TI, 1 x green TI, 12 x 500 incs. Target Schweinfurt, no cloud, smoke screen. Visibility downward poor, horizontally good. Bombed on H2S and markers. Dropped yellow TI at datum point and stood off. Reserve flares called in, then Mosquitoes marked. First marker to south ignored, second assessed over VHF as 500 yards south. Visual backers up called in to back up. Followed them in to bomb most northerly RSF at 0208 hours. ND807P F/O W.M.Reid, Sgt J.Richards, F/O R.D.Parker, F/Sgt E.D.Moir, F/Sgt B.Harthill, F/Sgt D.P.Cannings, Sgt G.Brown. Up 2116 Down 0442. 6 clusters 7” flares, 6 x 1000lb MC. Air frame factory at Kjeller located visually by flares and ground detail. Good visibility. On arrival a good concentration of flares was seen. Dropped own visually on aiming point as existing flares seemed slightly to port of aiming point. Bombed RSF, seemed to be RSF. One big explosion at 0133 hours causing target to be covered with smoke. ND807P F/O W.M.Reid, Sgt J.Richards, F/O R.D.Parker, F/Sgt E.D.Moir, F/Sgt B.Harthill, F/Sgt D.P.Cannings, Sgt G.Brown. Up 2202 Down 0508. 6 clusters 7” flares, 6 x 1000lb MC, 3 x 4.5” flares. Identified target by RSF and bomb bursts. One RSF on building which was on fire. Target area very well marked and bombed. We were told no flares needed and were called in to bomb at 0130 hours. Whole of target area was well alight. ND807P F/O W.M.Reid, Sgt W.Richards, F/O R.D.H.Parker, F/Sgt G.D.Moir, F/Sgt B.Harthill, F/Sgt D.P.Cannings, Sgt G.Brown. Up 2138 Down 0524. 6 clusters 7” flares, 5 x 1000lb MC, 3 x TI green no 4, 3 x 4.5” rec flares. Identified target by flares and visually. First RSF appeared to be on aiming point and attracted bombing which caused several orange and red and blue explosions. Own bombs caused an explosion and attack generally appeared well concentrated on and around aiming point. ND807P F/O W.M.Reid, Sgt W.Richards, F/O R.D.H.Parker, F/Sgt G.D.Moir, F/Sgt B.Harthill, F/Sgt D.P.Cannings, Sgt G.Brown. Up 0036 Down 0518. 6 x 7” cluster flares, 8 x TI RSF, 3 x 4.5” reco flares. Identification of target made visually and by RSFs. Bombing undershooting at beginning, then explosions started. First reds were 50 yards to west of aiming point but later reds good, and order was given Main Force to bomb the fires. ND807P F/O W.M.Reid, Sgt W.Richards, F/O R.D.Parker, F/Sgt G.D.Moir, F/Sgt B.Harthill, F/Sgt D.P.Cannings, Sgt G.Brown. Up 2203 Down 0112. 6 x 7” clusters, 1 x 4000lb HC, 8 x 500lb MC, 3 x 4.5” reco flares. Weather clear, ground haze. Identified target on H2S. Re-marking became necessary and more flares were asked for. Fresh lot of reserve flares went east of target, so we were asked to drop our internally stowed flares to west of these. Main Force came in after second marking and did some very good bombing resulting in several good explosions around 2355 hours; there was no scatter of bombs noted. ND807P F/O W.M.Reid, Sgt W.Richards, F/O R.D.Parker, F/Sgt G.D.Moir, F/Sgt B.Harthill, F/Sgt D.P.Cannings, Sgt G.Brown. Up 2253 Down 0422. One flare red/green stars, 1 x 2000lb HC, 1 x TI green No 4, 11 x “J” type clusters. 8/10ths cloud and haze. Tops approx 7,000’. Target identified by H2S. Heard markers trying to contact Controllers. Flares estimated east of target. Waited to release skymarkers, had orders to release so bombed. Order for Wanganui received at 0124 hours, returned and released own skymarker; approx 3 seen; Controller not heard; Deputy took over at H+2. ND807P F/O W.M.Reid, Sgt W.Richards, F/O R.D.Parker, F/Sgt G.D.Moir, F/Sgt B.Harthill, F/Sgt D.P.Cannings, Sgt G.Brown. Up 2244 Down 0229. 12 x 7” clusters, 2 x 1000lb MC, 3 x 4.5” reco flares. 10/10ths cloud. Target located on H2S. No wind given by Controller who at 0038 hours told us to standby for few minutes and at 0040 hours instructed us to return to base. ND807P F/L W.M.Reid, Sgt W.Richards, F/O R.D.Parker, F/Sgt E.J.Watson, F/Sgt B.Harthill, F/Sgt D.P.Cannings, Sgt G.Brown. Up 2353 Down 0307. 12 x 7 x 4.5” clusters, 2 x 1000lb MC, 3 x 4.5 reco flares. Weather clear, vis good. Target located on H2S and Gee. First stick of flares went down at 0127.30 hours. Controller said first wave were to starboard of target and drifting over sea. Second wave rectified this. RSF considerably delayed. Aircraft was called a third time when RSF fell at 0148, which aircraft bombed at 0154 hours. Main Force mostly delayed by late RSF, only one of which was seen. ND807P F/L W.M.Reid, Sgt W.Richards, F/O R.D.Parker, W/O G.D.Moir, F/Sgt B.Harthill, F/Sgt D.P.Cannings, F/Sgt G.Brown. Up 2134 Down 0323. 9 x 7 x 4.5” clusters, 9 x 500lb MC, 3 reco flares. Weather clear. Identification of target by H2S and ETA. Dropped flares and orbited to starboard. Mosquito went in right away. His red marker was assessed as being on the corner of the road. Controllers called in to back up which was done very quickly. Flare Force called in to bomb, markers told to go home with exception of Marker Leader. 0047 hours Flare Force told no more flares needed. Main Force called in to bomb. Wind received 350/19 knots. ND807P F/L W.M.Reid, Sgt W.Richards, F/O R.D.Parker, W/O G.D.Moir, F/Sgt B.Harthill, F/Sgt D.P.Cannings, F/Sgt G.Brown. Up 2310 Down 0312. 4 x TI green, 1 x TI yellow No 16s, 9 x 7” clusters, 3 reco flares. 10/10ths low stratus, tops 2,500’. Target seen visually – Oboe markers and H2S. Told to drop flares. Yellow Oboe 0132.5 hours. Headed towards this to back up. Another yellow down 1 ½ miles north of previous yellow; orders given to back up second one. Backed up the greens and returned to base. Large explosion in target area at 0145 hours. ND961N F/L W.M.Reid, Sgt W.Richards, F/O R.D.Parker, W/O G.D.Moir, F/Sgt B.Harthill, F/Sgt D.P.Cannings, F/Sgt G.Brown. Up 2254 Down 0502. 9 x 7” clusters, 8 x 500lb MC, 1 x 500lb MC LD (12 hrs), 3 rec flares. Target seen by flares, H2S and visually on RSF. Flares down on time and excellently placed. Markers down one minute afterwards, backed up with green and red TI. First stick of bombs blew up RSF and a terrific explosion 0157 hours. Called in to bomb at 0159 hours. Bombing excellent, very great number of explosions continued after we had left area. ND961N F/L W.M.Reid, F/Sgt W.Richards, S/L P.A.Stevens, W/O G.D.Moir, F/Sgt B.Harthill, F/Sgt D.P.Cannings, F/Sgt G.Brown. Up 2305 Down 0200. 9 x 7” clusters, 5 x 1000lb MC/GP, 3 rec flares. Weather clear, some haze. Identified target visually. First green TI went down in middle of marshalling yards. The reds had been on the southern end of yards. Greens assessed 100 yards 12 o’clock. Bombing very concentrated on markers. Attack went as planned. Marking was quick and accurate. Fighter activity on way out to French coast. Bombs seen exploding before time ordered. ND961N F/L W.M.Reid, F/Sgt W.Richards, F/L R.L.Parker, W/O G.D.Moir, W/O B.Harthill, F/Sgt D.P.Cannings, F/Sgt G.Brown. Up 2200 Down 0520. 6 x 4 flares white, 2 x TI red LB, 1 x 4000lb HC, 4 x 500lb MC, 1 flare green/red. No cloud, some ground haze. Target seen by TI red. On arrival two small fires still burning. One yellow TI at 0145.5 hours on bombing run. TI seen to explode, followed by another. Too early in attack to give an impression of concentration. H2S u/s on return route. ND861N F/L W.M.Reid, F/Sgt W.Richards, F/L R.L.Parker, W/O G.D.Moir, W/O B.Harthill, F/Sgt D.P.Cannings, F/Sgt G.Brown. Up 1513. Down 1822. PB157Q F/L G.F.Baker, W/O H.Townsley, F/L J.W.Muller, P/O E.J.Watson, F/O J.F.Thomson, F/O A.H.Jones, W/O R.M.Clark, F/O G.Polson (FG). Up 1459 Down 1908. ND746L F/L R.L.C.Lasham, F/Sgt K.Randle, F/Sgt C.Bosley, P/O T.W.Black, Sgt D.S.Nicholls, F/Sgt R.F.Powell, F/Sgt E.W.Cope. Up 1507 Down 1838. Weather – 10/10ths cloud 6,000’ strata-cu. Results – Cloud base too low for force to descend to attack. Controller ordered mission to be abandoned and aircraft to continue on their course and return to base without bombing at 1657 hours. Opposition Encountered – no fighters and slight flak from approximately 12 guns, ineffective. PB156O F/L W.M.Reid, F/Sgt W.Richards, F/L R.L.Parker, W/O G.D.Moir, W/O B.Harthill, F/Sgt D.P.Cannings, F/Sgt G.Brown, Sgt D.J.Watts (FG). Up 1435 Down 1900. Weather & Results – one comparatively small patch of cloud which unfortunately obscured target on line of approach prevented many aircraft from identifying target. Smoke and dust from other attacks and the fact that markers were burnt out by the time aircraft had arrived, caused a scattered attack. Some aircraft bombed correct target, others believed to overshoot and follow another attack, whilst others bombed woods to south east of target. Results very inconclusive. Opposition Encountered – moderate to intense heavy flak. ND961N F/L W.M.Reid, Sgt W.Richards, F/L R.L.Parker, W/O G.D.Moir, W/O B.Harthill, F/Sgt D.P.Cannings, F/Sgt G.Brown. Up 1140 Down 1600 (Wittering). Weather – 3/10ths cloud. Results – leading aircraft reported aiming point clear and very clearly visible. Very soon afterwards whole area covered by smoke. Opposition Encountered – moderate heavy flak, accurate. ND961N F/L W.M.Reid, F/Sgt W.Richards, F/L R.L.Parker, W/O G.D.Moir, W/O B.Harthill, F/Sgt D.P.Cannings, F/Sgt G.Brown. Up 1037 Down 1512. Weather – 3/10ths to 7/10ths cloud. Cumulus tops 12,000’. Results – Controller ran up approx 5 miles to starboard. He recognised the target to port and ordered a sharp turn to port. Most aircraft immediately astern were able to make turn in time, but some further on his starboard could not make the turn in time and some overshot by 2000 yards. This turn did not appear to affect too seriously the rear formations and some accurate bombing resulted. The target area was covered with dust up to 12,000’ by 1332 hours. Opposition Encountered – Slight heavy flak increasing to moderate in early stages. No signs of fighters. 6.8.44 Today also the training flights were overshadowed by another operation against a flying bomb base at Bois de Casson, for which 9 of our aircraft were detailed. The raid was not a great success as the controller’s navigational equipment became unserviceable at the English coast out. A deputy controller took over and led the force into a large cumulus nimbus cloud which was lying across track. The formation broke up in the cloud and on emerging had spread over many miles of sky. The target was bombed more or less by individual aircraft, and the bombing that did occur was believed to have been accurate. There was moderate heavy flak over the target and the fighters attacked the aircraft which were most dispersed on breaking cloud. ‘J’ captained by F/O Bucknell RAAF, did not return from this mission. ND495N F/L W.M.Reid, F/Sgt W.Richards, F/L R.L.Parker, F/Sgt T.Savage, W/O B.Harthill, F/Sgt D.P.Cannings, F/Sgt G.Brown. (Deputy Controller I – Target 1). Up 2054 Down 0246. 9 x 7” clusters, 4 x 1000lb ANM 44, 1 x 1000lb ANM 65, 2 Wanganui flares. Thin cloud layer 10,000’, hazy below. Target identified on H2S, Gee and ETA. Initial flares at 2343 hours scattered and slightly south of aiming point. Markers could not identify actual aiming point. Wanganui red/green was dropped to north; third wave dropped over this way. This was sufficient. Marker dropped green TI 2347 hours(?). Assessed as 200 yards 180 degrees. This should have been cancelled by yellow but was not doen. Another green was dropped almost on aiming point (50 yards) and was backed up by more green TIs. Main Force ordered to bomb. This carried on and at 0008 hours “Cease bombing” order given while more greens were put down. At 0012 hours 9 seconds delay was given for bombing and this was immediately followed by “Complete bombing and return to base”. (0013 hours). ND961N F/O W.M.Reid, F/Sgt W.Richards, F/L R.L.Parker, W/O G.D.Moir, W/O B.Harthill, F/Sgt D.P.Cannings, F/Sgt G.Brown. Up 0931 Down 1328. 7 x 1000lb ANM 65, 3 x 1000lb ANM 44, 1 x 1000lb MC, 4 x 500lb GP. Clear sky, excellent visibility. Located target visually. Nearly every stick of bombs seen to fall on the airfield across runways. Later covered with pall of smoke. 3 yellow TIs seen, one on runway, 2 on starboard side of runway. Two bombs falling from aircraft above us passed within about 5 feet of our tailplane. Wind received 319/4.5 knots. Aircraft slightly damaged from explosion of aircraft behind; Perspex in rear turret shattered. It’s amazing that this last op was one of the scariest of them all! Bob Lasham, 97 Squadron pilot, was also on this operation and I remember talking to him with Dad at a 97 Squadron Reunion in Horncastle about this daylight to Deelen op when they shared their memories of it. Bob said one of his gunners had a grandstand view as a bomb from above fell past and hit the aircraft below, completely severing the rear turret and clearly remembered seeing the aircraft break apart and the turret tumbling over and over as it fell through the sky, no doubt with the rear gunner still trapped inside.